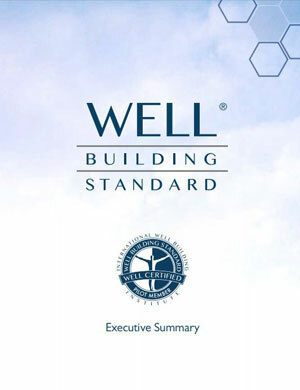 The WELL Building Standard is a performance-focused system for measuring, certifying, and monitoring features of the built environment that impact human health and wellbeing including air, water, nourishment, light, fitness, comfort, and mind. It is currently in pilot and available for use for new construction and major renovations in the commercial, residential multifamily, and institutional market sectors. The WELL Building Standard was developed through seven years of consultation with leading medical scientists and building industry practitioners, and is grounded in medical research that demonstrates the connection between buildings – where we spend more than 90 percent of our time – and health and wellness impacts on occupants. WELL sets performance requirements in seven categories: air, water, nourishment, light, fitness, comfort, and mind. The International WELL Building Institute (IWBI) administers the WELL Building Standard. IWBI is a public benefit corporation (B-Corp) that was created by Delos, a Wellness Real Estate company, to administer the WELL Building Standard to fulfill a Clinton Global Initiative commitment to make the standard available globally. IWBI will administer a transparent peer review of the WELL Building Standard in Summer 2014 prior to the full release of the program. The IWBI also administers certification under the WELL Building Standard, in collaboration with the Green Building Certification Institute (GBCI), the same organization that certifies LEED green buildings, which serves as a third-party auditor for the IWBI. On-site post-occupancy audits of WELL Building features including air and water quality are required for WELL certification, and re-auditing every three years is required to maintain certification. The WELL Building Standard works in alignment with the LEED Green Building Rating System, the Living Building Challenge, and other leading global sustainable building programs. WELL enables green building practitioners to integrate human health and wellbeing with sustainability, creating buildings that optimize occupant as well as environmental impacts. Current WELL pilot projects include the William Jefferson Clinton Children’s Center in Port-au-Prince, Haiti. Named in honor of President Clinton, the children’s center and orphanage will be LEED Platinum and WELL certified. Another recent example of the alignment between WELL and LEED includes CBRE Group Inc.’s new Global Corporate Headquarters in downtown Los Angeles. Unveiled in November 2013, CBRE’s new headquarters is the world’s first commercial office space to be both Gold LEED and WELL certified.